With all due respect to the hackers and makers out there that provide us with all these awesome projects to salivate over, a good deal of them tend to prioritize functionality over aesthetics. Which isn’t a bad thing necessarily, and arguably better than the alternative. But for many people there’s a certain connotation around DIY, an impression that the final product is often a little rough around the edges. It’s usually cheaper, maybe even objectively better, but rarely more attractive. Which makes builds like this absolutely beautiful 3D printed Bluetooth speaker by [Ahmsville] especially impressive. Not only did he engineer a fantastic sounding speaker that projects stereo sound no matter where you are in the room, he clearly gave a lot of thought into making the final product look as good as it sounds. 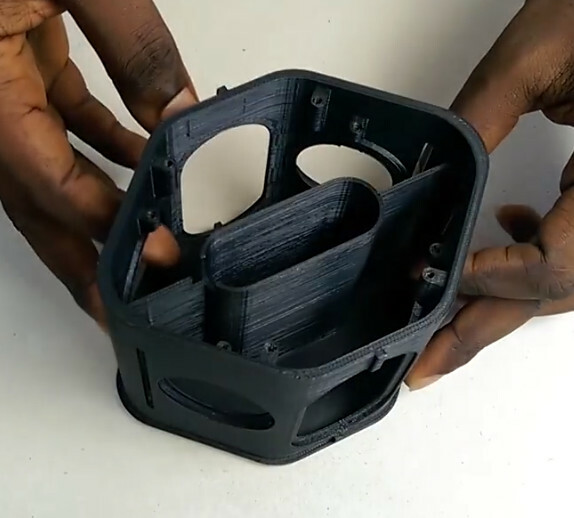 The 3D-printed enclosure provides separation for the four internal speakers and two passive radiators, as well as holding the electronics. A custom made 3S battery powers the Bluetooth module though an isolated step-down module, and the twin 18 W TDA2030 amplifiers feed their respective pair of drivers. The device is surrounded by an impressively detailed 3D-printed mesh, which is then wrapped with some speaker grill fabric to give it a very professional look. In the video after the break, [Ahmsville] shows a time-lapse of building the speaker, as well as a demonstration of how it sounds on his desk. 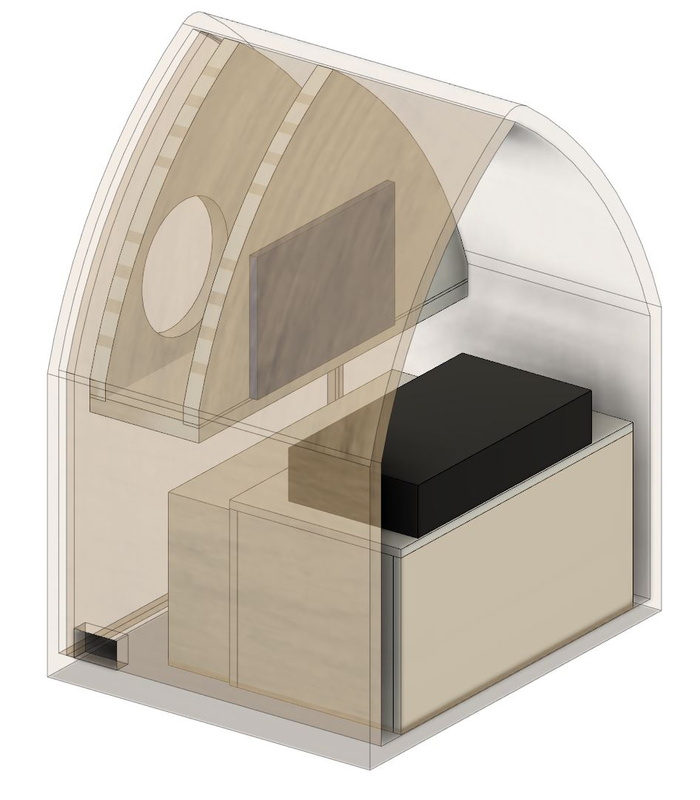 If you’re more about function than what the finished product looks like, we’ve covered speaker enclosures made out of various types of actual trash which you can take a look at. This Bluetooth speaker is full of delightful surprises. The outer shell is an antique radio cabinet, but its practically empty interior is a combination of Dead Bug circuitry and modern BT receiver. [PJ Allen] found the BT receiver on Groupon and decided to whip up amplifier and threshold detector circuits using only parts he already had in order to make this vintage-looking Bluetooth speaker. The cabinet is from a Silvertone Model 1955 circa 1936. Don’t worry, no antiques were harmed in the making of this hack, the cabinet was empty when he bought it. The amplifiers, one per speaker, began life as a circuit from TI’s LM4871 datasheet. Some of the departures came about because he didn’t have the exact component values, even paralleling capacitors to get in the right range. The finished board is a delightful mix of “Dead Bug” and quasi-Manhattan style construction, “quasi” because he carved up the ground plane instead of laying pads on top of it. Look at the front of the cabinet and you’ll see a rectangular display. Watch the video below and you’ll see that it throbs in time to the music. To do that he came up with a threshold detector circuit which started out based on a circuit from a Sharp/Optonica cassette tape deck, but to which he made improvements. Not all cabinets come empty though. 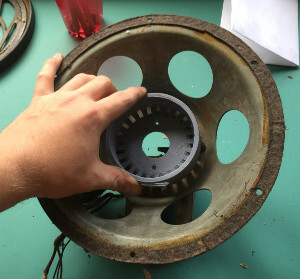 Check out this post by our own [Gregory L. Charvat] about restoring these wonderful old radios. After opening the speaker, [mcmchris] discovered a regular F-6188 Bluetooth audio module built around the BK8000L chip, with the audio jack connected to the chip’s aux input pins. Taking a close look at the PCB, the solution seemed obvious: cut the connection to the chip’s aux input pins, and connect the audio jack parallel to the audio signal itself. After some trial and error, the output pins of the on-board op amplifier seemed to provide the best audio signal for his shiny new output jack. You can see more details about the speaker’s inner life and a demonstration in the video after the break — in Spanish. If the concept looks familiar to you, we’ve indeed seen a very similar approach to equip a Google Home Mini with an audio output jack before. The alternative is of course to just build a decent sized Bluetooth speaker yourself. The phrase “They don’t make them like they used to” is perhaps best exemplified by two types of products: cars and consumer electronics. Sure, the vehicles and gadgets we have now are so advanced that they may as well be classified as science-fiction when compared to their predecessors, but what about that style. Our modern hardware can rarely hold a candle to the kind of gear you used to be able to buy out of the “Sears, Roebuck and Company” catalog. So when [Democracity] came into possession of a wickedly retro art deco speaker, it’s no surprise he saw it as a perfect opportunity to bring some of that old school style into the 21st century by rebuilding it with an Amazon Echo Dot at its core. The fact that the original device was a speaker and not a full radio made the conversion much easier, and will have everyone trolling yard sales for months trying to find a donor speaker to build their own. To start the process, [Democracity] popped the panels off and ripped out what was left of the speaker’s paper cone and coil. In a stroke of luck, the opening where the driver used to go was nearly the perfect size to nestle in the Echo Dot. With a 3D printed cradle he found on Thingiverse and a liberal application of epoxy, the Dot could get snapped into the speaker like it was always meant to be there. [Democracity] then picked up some absolutely gorgeous speaker cloth on eBay and hot glued it to the inside of the panels. What was presumably the volume knob was pulled out of the bottom and turned out to be a perfect place to run the Dot’s USB cable out of. 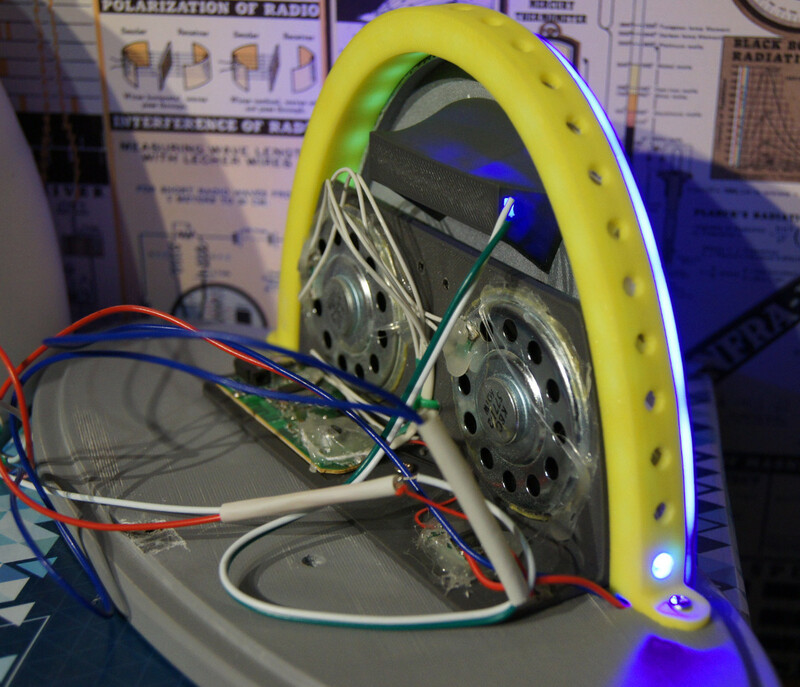 A lesser man would have called this project completed, but [Democracity] knows that no hack is truly complete without the addition of multicolored blinking LEDs. With the RGB LED strips installed inside, the light is diffused through the cloth panels and creates a pleasing subtle effect. You can almost imagine a couple of vacuum tubes glowing away inside there. Judging by the final product, it’s no surprise [Democracity] has a fair bit of experience dragging audio equipment kicking and screaming into the modern era. This isn’t the first time we’ve seen an old piece of audio equipment get a high-tech transfusion, and isn’t even the first time we’ve seen the Dot used to do it. But it’s certainly the one we’d most like to see sitting on our shelf. Let’s get something straight right up front: this isn’t much of an electronics project. But it is a very artistic 3D printing project that contains some electronics. [Sjowett] used an off-the-shelf class D amplifier with BlueTooth input to create a simple BlueTooth speaker with a subwoofer. As you can see from the pictures, woofer is exactly the term to use, too. The clever mechanical design uses 3D printing and common metric PVC pipe. That’s a great technique and resulted in a very clean and professional-looking build. If you don’t have easy access to metric pipe, you could print the pipes, but it will take longer and might not look quite as good.